All of our patterns are full size black and white images. Look at them like you would look at a photographic negative. You remember those, right? Scroll & Fan Pattern piece snippet. Solid black for reverse applique. Scroll & Fan, Medallion III. 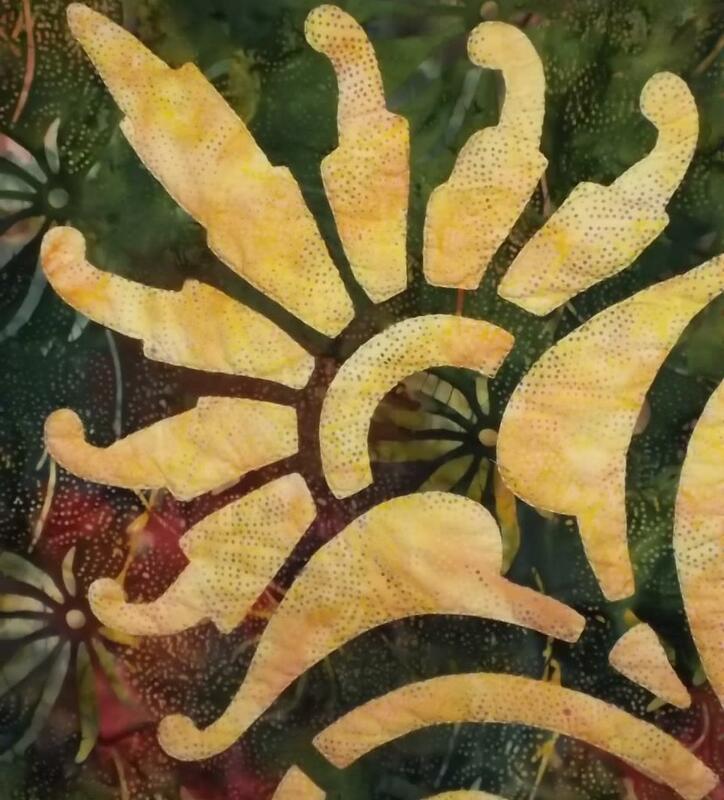 Reverse applique revealing the yellow background fabric. What is light in a photo is dark on the negative, and what is dark in a photo is light on the negative. Your completed piece will have a medium - dark top fabric and a light background fabric. So when you look at the black and white pattern piece, what is white will be your medium - dark fabric in the finished piece, and what is black will be your light fabric in the finished piece. What is black on your pattern will be cut away and discarded. Those places cut away will show your beautiful lighter background fabric peaking through. Some of our patterns have black and cross-hatched shapes. The black denotes where you will cut away the top fabric and reverse applique to your background. The cross-hatching denotes where you will applique a 3rd fabric on the top. Vintage Jewel pattern snippet. Solid black for reverse applique and crosshatched shapes for applique. Vintage Jewel table runner 6. Reverse applique & Applique. If the pattern is applique only, like the borders for the Victorian Flower Garden Quilt IV expansion pattern, the design will be solid black. 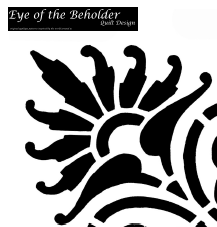 For these patterns, the black will be a fabric you applique on the background. Victorian Flower Garden Header/ foot border pattern piece snippet. Solid black for applique. Victorian Flower Garden Quilt IV expansion. Border gate is appliqued onto the background fabric. Then enjoy the journey. Watch, as you cut and then sew, and witness the beauty of the pattern design materialize in front of your eyes with the lovely contrast of color and hue you have selected.